Bean Bags R Us NewsOutdoor Bean BagsWhat is the Best Material for Outdoor Bean Bags? What is the Best Material for Outdoor Bean Bags? Nothing beats lounging by the pool in the comfy softness of premium bean bag furniture. If you’re the proud owner of a Bean Bags R Us outdoor bean bag chair or lounge, you already know our outdoor products are the best on the market, but do you know why? It’s because unlike most bean bag products made for the mass market; ours start with the best materials. To fully appreciate the difference in quality, it helps to understand why some cover materials are better suited for outdoor use than others. When it comes to withstanding the elements, fabric type, denier, waterproof coatings and other treatments are all important factors. The following guide will help you understand the most common materials used for making bean bags. Numbers and letters you see in the names of polyester and nylon materials aren’t just random. The “D” in 1680D polyester stands for denier; it’s a unit of measurement that denotes the linear mass density or thickness of the fibres that make up the fabric. Denier can be used to measure strength or durability in like materials. To make materials intended for outdoor use resistant to water, and improve their general durability, coatings made from polyvinyl chloride (PVC) and polyurethane (PU) are often applied to their surfaces. Although PVC and PU coatings are similar, there are a few notable differences. PVC coatings tend to disintegrate faster in higher temperatures or after prolonged exposure to direct sunlight. PU is a flexible, rubber-like substance that withstands high temperatures better. In general, PVC-coated materials are waterproof but are not breathable fabrics. PU-coated materials can be both waterproof and breathable. Also to PVC or PU coatings, other treatments to increase the longevity of outdoor materials may be present. Some fabrics are treated with components that deter the growth of bacteria, mould and mildew. One such additive is a silver ion that bonds with substances that are essential for bacterial growth survival. Antimicrobial fabrics are often used in hospitals and medical offices, and they may be useful for deterring bacteria and mould growth on outdoor products in the absence of adequate moisture control. Your skin isn’t the sun’s only victim. Any material that faces daily sun exposure is subject to fading, bleaching and general damage from heat and ultraviolet rays. 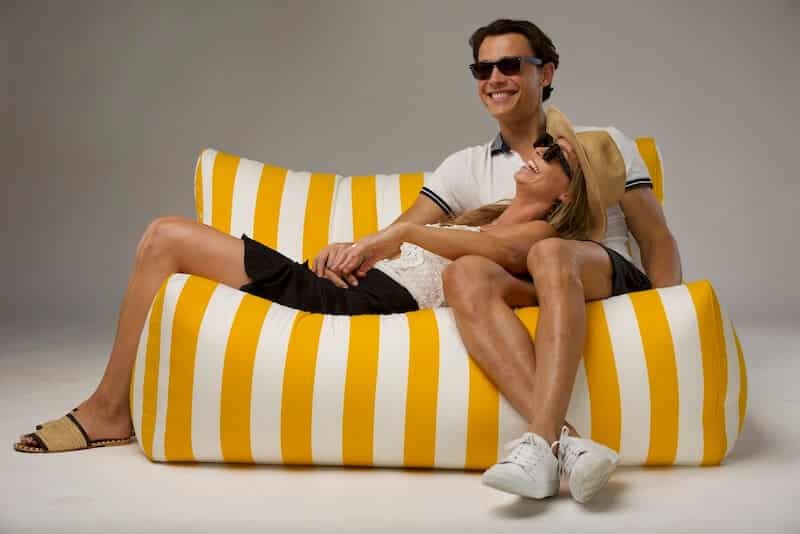 Fabric treatments that protect against UV rays or deterioration of textile dyes help can keep your beautiful outdoor bean bag chair looking bright and new. The cheapest mass-produced bean bags you find at discount department stores are often made from 400D polyester. The fabric may or may not be coated to improve its quality and enable outdoor use. Sitting squarely at the bottom of the quality ladder, 400D polyester isn’t very comfortable. It’s thin and lightweight, difficult to clean and has an overall cheap appearance and feel. Another common choice is 420D nylon with an added PVC coating. As mentioned before, nylon is naturally stronger than polyester, so this material is tougher than the numbers might imply. It’s an acceptable choice, but it lacks the flexibility and comfort of higher density polyester. Some products are made with 600D nylon or polyester. These are higher on the quality scale and provide more comfort. We’ll be adding 600D designs to our 2015 product range. Products made with higher-quality 1200D and 1280D covers are infrequently seen. At the top of the polyester range is 1680D polyester with a PU coating. Every outdoor bean bag chair we create is made from this top-rated material. It delivers the greatest durability, the most comfort, and the easiest care. You may see a variety of bean bags made using canvas, but they are heavier, more expensive and uncomfortable. We feel this is an impractical material for bean bags. The material used to create our outstanding quality outdoor bean bag chairs delivers everything we need to ensure our products outlive, outrank and outshine their peers. Here’s how. Our 1680D polyester covers are four times as thick as the 420D alternative used for indoor bean bags. They resist tearing and stand up to the elements as well as rowdy kids and pets. The colourfast fabric is four times as dense and holds four times as much dye to keep its brilliant colour longer. The PU coating provides the best possible protection against deterioration in direct sunlight. Cleaning our water-resistant covers is a breeze. All you need is a mild detergent, a soft-bristled brush, and a clean, dry cloth. With minimal care and maintenance, you can expect our bean bags to provide blissful comfort and exceptional performance for many years. Now that you understand what goes into making our bean bags, you’ll never waste another dime on cheap imposters made from inferior materials that tear, fade and fall apart after only a few weeks. The ultimate in outdoor comfort can be yours when you choose outdoor bean bag chairs and lounges from Bean Bags R Us. Our range includes something for every age and lifestyle. Check out the Big Boppa, the Daddy Cool and the Lazy Bro for casual adult seating. Our Billy the Kid chair is perfect for your little ones. To relax in complete comfort, try the Relax Sis or the Malibu Lounger. We even have pool floats so you can cool off in total luxury. With their tough and reliable exterior, all of the 1680D polyester products are suitable for virtually any outdoor setting. What is Solution Dyed Acrylic & Why is it So Good?